My name is Martyn Gillie and I am a local historian and tour guide for the Arkwright Society. I do guided tours of Lumsdale and can identify the buildings in the attached photo. 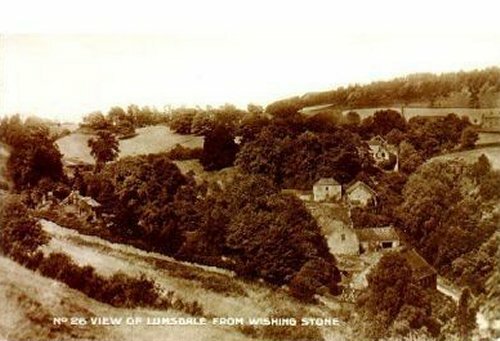 It was taken from the wishing stone area of Matlock which is off Asker Lane. The house on the left is Lumsdale House, once owned by John Garton who ran bleaching mills in the valley. (See Census: 1841, 1851 and 1861) The buildings on the right are as follows. The top one was a corn mill which closed in 1929. The next one down were maintenance sheds, the building below that was a bleaching mill. The lowest one down was originally built as a cotton mill being of the same design as Cromford Mill and built around 1784. Part of the lower complex also included a blacksmiths.